WASHINGTON — Foreign Affairs Minister Chrystia Freeland says she's optimistic about the "intense" talks now under way in the accelerated search compromise on the North American Free Trade Agreement. As she emerged from the high-stakes meeting with her U.S. counterpart Wednesday in Washington, Freeland emphasized the "compromises" by Mexico in their bilateral trade deal with the U.S. to increase the wages of its auto workers. She suggested that bodes well for progress but she cautioned much more work needs to be done. Freeland has credited the Mexicans for their difficult decision to compromise on labour and wages as part of its auto rules of origin talks with the U.S., saying it has cleared the way for more substantive talks between Washington and Ottawa. 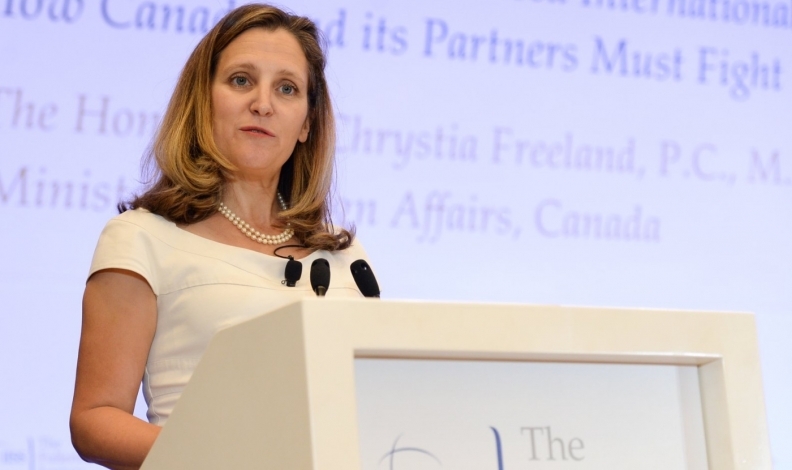 "There are some important things we believe we have accomplished together with the United States and thanks to some significant compromises Mexico was prepared to make to support Canadian workers," Freeland said after her morning meeting with U.S. Trade Representative Robert Lighthizer. "This is a really important step for us and it has set the stage for very intensive conversations and negotiations that we're going to have this week." Freeland said the higher Mexican wages would result in "better conditions for working people in Canada and also in the United States in high wage countries." She added: "Our workers have been concerned for a long time — it was one of our election issues — about the ways in which trade agreements can harm blue collar workers in high wage countries." U.S. President Donald Trump announced the deal with Mexico on Monday and has pressured Ottawa to join the new agreement by Friday — otherwise he says he will impose devastating tariffs on Canada's auto sector. After being absent from a month of U.S.-Mexican discussions, Canada's team is back in full force in the American capital for the first time since the spring and Freeland says the negotiators are intensively focused on finding new areas of compromise. Freeland said Canada was "extremely involved" in the progress that was made between the U.S. and Mexico over the summer. She and Lighthizer are to meet again later Wednesday as their officials continue to negotiate. Freeland said she and her officials had already been hard at work since the crack of dawn, meeting with negotiators and working the phones. There are now big questions whether Canada is willing to open up access to its controversial supply-managed dairy market or if it will back away from its hard line to preserve NAFTA's dispute settlement system.